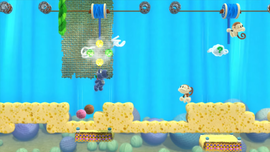 Monkeying Round and Round is the first level of World 4 in Yoshi's Woolly World. The level opens with a single rope and an Ukiki. A few more Ukikis follow, with more ropes. After another climb downwards via rope, more Ukikis and ropes that now move on lines appear. After another small segment featuring ropes that expand/contract, there is a rope that Yoshi must climb to enter the next area and reach the first checkpoint. A section consisting of sponge dirt and more Ukikis follow. Afterwards, Yoshi will come across several Ukikis eating watermelons, which he can steal. Afterwards, Yoshi can take a warp pipe leading directly to the second checkpoint. The next challenge involves many ropes, as well as many more watermelon-eating Ukikis. Afterwards, the goal roulette awaits. Smiley Flower 1: Behind an edible wall to the left of three climbable ropes in a row. Smiley Flower 2: In a visible alcove to the left of the third line-controlled rope. Smiley Flower 3: Revealed via a hidden Winged Cloud near the end of the sponge dirt segment after the first checkpoint. Smiley Flower 4: Inside a mound of sponge dirt, guarded by watermelon-eating Ukikis. Yoshi must wait until the Ukiki closest to the Smiley Flower spits out enough seeds to expose a path, then Yoshi must carefully make his way to the Smiley Flower. Smiley Flower 5: Immediately after the second checkpoint, in a Winged Cloud by many ropes. To get it, Yoshi must steal a watermelon from a nearby Ukiki and spit it out at the Winged Cloud. Wonder Wool 1: Behind an edible wall to the right of the same three climbable ropes near the first Smiley Flower. Wonder Wool 2: Yoshi must take the first line-controlled rope and fill in the warp pipe outline via yarn ball and enter the warp pipe. Inside the secret room, Yoshi must defeat the Ukikis and climb the ropes to reach the Wonder Wool. Wonder Wool 3: Just after the first checkpoint, in plain sight. Yoshi must simply jump at it to collect it. Wonder Wool 4: After a few watermelon-eating Ukikis, there is a visible green warp pipe that Yoshi can enter. 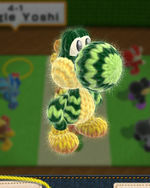 Inside the secret area, Yoshi must clear up the sponge dirt by jumping and using the watermelon to obtain the Wonder Wool. Wonder Wool 5: Just above and to the right of the topmost of the last two line-controlled ropes. Yoshi must simply jump from that rope to collect it. Collecting all of the Wonder Wools knits Jungle Yoshi back together. This page was last edited on October 29, 2018, at 09:19.